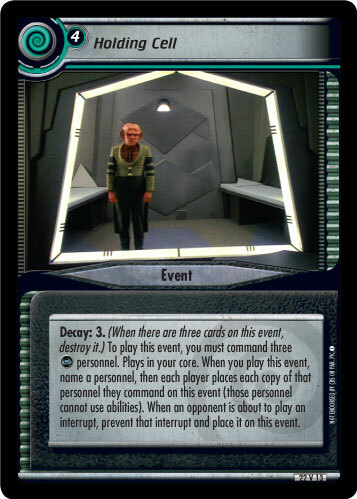 If you've had a look at the cards that have been revealed so far, you'll have noticed that Sent Back, a support card for the mean green Romulan machine, allows you to surgically remove a specific personnel – at least, for a time. So, why not just destroy your Holding Cell so I can play another copy of My Favourite Personnel? Easier said that done. Here, the Holding Cell's secondary function kicks in: it eats interrupts. As long as there is room in the cell, any interrupts your opponent tries to play (maybe a Grav-Plating Trap to break Kruge (Instinctive Commander) out of prison?) will be absorbed by the force-field until the Decay count of three is reached and the event destroyed, releasing the cards it held to the discard pile(s). Note that you can have multiple Holding Cells in play, so you can hold up to three key personnel captive at the same time, while being immune to up to six interrupts. Of course, in order to play Holding Cell in the first place, some Defensive Upgrades can help to make sure your expensive event isn't countered right away. In a way, this is even better than placing your opponent's key personnel in your brig, where a simple Rescue Captives would be enough to bail them out again. With Holding Cell, can once more show its signature theme of protecting our stuff to make sure the prisoners won't escape. Cards like Number One (Reputable Officer) or Skalaar (Bounty Hunter) won't be of any use trying to get through that force field to free their friends; if your opponent wants to play those personnel in the cell again, they will have to destroy the event. Of course, Miles O'Brien (Repair Chief) won't like this. The easiest way to get rid of the event seems to be to waste some interrupts and force Holding Cell to decay. That will do the trick, but is it worth it? Finally, don't forget that Holding Cell is not limited to the crew. It only requires three personnel to play, so besides the given Mouth of the Wormhole (Deep Space 9), Bajor (Gift of the Prophets) and Earth (Home of Starfleet Command), even and decks can take advantage of it without too much trouble. So, who is going to be the first personnel you're going to arrest? Let us know on the message boards!